Follow @Rotoworld_BB and @RealNickDoran on Twitter. 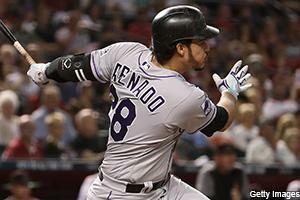 The Rockies and 3B Nolan Arenado avoided arbitration by agreeing to a one-year, $26 million contract. The two sides came to an amicable settlement after Arenado requested $30 million and the Rockies countered with $24 million. The $26 million deal is a new record for an arbitration-eligible player, shattering the mark set last year when Josh Donaldson snared $23 million from the Blue Jays in his last shot at arbitration. Arenado will be a free agent after the upcoming season unless the Rockies are able to convince him to sign an extension. Arenado's salary will be tied with Giancarlo Stanton for the tenth-highest in the majors this year. The 27-year-old third baseman batted .297/.374/.561 with 38 home runs and 110 RBI last year. Angels general manager Billy Eppler told reporters on Thursday that Shohei Ohtani will not be ready for Opening Day. Eppler also said that Ohtani has not yet taken any swings since undergoing Tommy John surgery on his throwing elbow in October. It is a foregone conclusion that he will not be able to pitch at all this season, but the hope is that he will be able to serve as the Angels' regular designated hitter. Today's news sets back his timetable quite a bit and makes him a very risky bet on draft day. He won the American League Rookie of the Year last season as the best two-way player in baseball since Babe Ruth. He batted .285/.361/.564 with 22 home runs, 61 RBI and 10 stolen bases in 367 plate appearances between pitching starts. So clearly, even as a one-way player he can still help lead fantasy teams to victory if he's healthy enough to see regular at-bats. The Diamondbacks signed RHP Greg Holland to a one-year, $3.5 million contract. The veteran closer is now the pre-season favorite to snare the ninth-inning job come Opening Day. Youngster Archie Bradley was atop the Diamondback's bullpen depth chart prior to Holland joining the team. Holland has 189 career saves, ranking him sixth among all active pitchers -- behind Craig Kimbrel (333 saves), Fernando Rodney (325), Kenley Jansen (268), Aroldis Chapman (236) and Joakim Soria (220). Holland was basically the baseball version of Jekyll and Hyde last year -- he had a 7.92 ERA in 32 games with the Cardinals in the first half and then rebounded with a 0.84 ERA in 24 games with the Nationals in the second half. He had an unlucky .379 BABIP with the Cardinals and a lucky .186 BABIP with the Nationals. The real Greg Holland is obviously in the middle. He has a career 2.83 ERA with a .296 BABIP and an 11.63 K/9 since making his debut with the Royals in 2010. ** Multiple outlets reported that the Astros have signed free agent left-hander Wade Miley to a one-year, $4.5 million contract. The deal is not official yet but there is so much smoke around this one that there has to be a fire. The Astros have three rotation slots locked down by Justin Verlander, Gerrit Cole and Collin McHugh. Miley will take the fourth slot. He employed a smoke-and-mirrors approach to register a 5-2 record and 2.57 ERA in 16 starts for the Brewers last year despite his strikeout rate tumbling to a career-low 5.58 K/9. Fantasy owners should be skeptical that he can come anywhere close to repeating that minuscule ERA again. His ERA was 5.61 in 2017 and 5.37 in 2016. It would not be a surprise if the Astros were to sign another free agent starter in the next few weeks, perhaps even Dallas Keuchel, who remains unsigned after declining a one-year, $17.9 million qualifying offer from the Astros. ** Joe Frisaro of MLB.com reports that the J.T. Realmuto trade talks are in "advanced stages." Frisaro pegs the Padres, Reds, Dodgers, and Braves as all being "in the mix," with San Diego possibly emerging as the "frontrunner". The Reds made an aggressive push to acquire Realmuto earlier this week and reportedly wanted a window to negotiate a contract extension for Realmuto but were denied that permission. Last week the Reds were able to make signing Sonny Gray to a contract extension a make-or-break condition of their trade with the Yankees, but they couldn't pull it off with the Marlins this time around -- at least not yet. Realmuto batted .277/.340/.484 batting line with 21 home runs and 74 RBI over 125 games last season. He is considered the best fantasy catcher in the league at this time. The Marlins' asking price for Realmuto has been astronomical for years. Any team that acquires him is going to have to sell the farm to get him. ** The Twins signed LHP Martin Perez to a one-year, $4 million contract with a $7.5 million club option for 2020. He is expected to join the rotation despite putting up a 6.22 ERA and 52/36 K/BB ratio across 85 1/3 innings for the Rangers in 2018. He might be better utilized as a situational lefty reliever because of his massive career platoon splits. For his career, right-handed batters have posted an .815 OPS against him, while left-handed batters have recorded a .650 OPS against him. Over the past three seasons combined, Perez's 5.18 K/9 is the lowest mark in the major leagues (min. 400 IP). ** MLB.com's Jon Morosi writes that the possibility of a Corey Kluber trade is "diminishing by the day." Kluber has drawn trade interest from a range of clubs, including the Dodgers, Padres, Reds, and Brewers, but the Tribe's asking price for the 32-year-old ace remains understandably sky-high and we're now just two weeks away from the beginning of spring training. Look for Kluber to take the bump on Opening Day for the Tribe. He finished third in the American League Cy Young Award balloting last season after going 20-7 with a 2.89 ERA, 0.99 WHIP, and 222/34 K/BB ratio in 215 innings. ** The Athletic's C. Trent Rosecrans reports that the Reds are in "serious" discussions with free agent reliever Zack Duke. The situational left-hander registered a 4.15 ERA with 51 strikeouts in 52 innings while seeing action in a whopping 72 games last year for the Twins and Mariners. He missed most of the 2017 season due to forearm surgery but was one of the better left-handed relievers in baseball for a number of years before that. ** There are at least four realistic teams pursuing Bryce Harper. He lists the Padres, Phillies, Nationals and White Sox. The Padres sent a high-level delegation to Harper's home in Las Vegas on Thursday to see if they could entice him to choose San Diego as his new workplace. ** Sources believe that the Braves are "lying in the weeds" to sign free agent reliever Craig Kimbrel. Heyman also notes that other teams interested include the Phillies, Nats, Red Sox, Twins and a mystery team. Kimbrel was seeking a six-year deal in the $90 million range early in the offseason but it is believed both the years and dollar amount have been dropping in recent weeks. Sooner or later the price will get low enough for a team to jump on it. The 30-year-old is coming off a season where he saved 42 games and posted a 2.74 ERA with a 96/31 K/BB ratio for the Red Sox. ** The Athletics are pursuing veteran catcher Matt Wieters. Wieters missed a big chunk of last season and batted just .238/.330/.374 with eight home runs and 30 RBI across 271 plate appearances for the Nationals. ** The Twins are "looking to add a reliever" and free agent Ryan Madson is among the "considerations." Madson registered an ugly 5.47 ERA and 1.41 WHIP in 52 2/3 innings of relief last season between the Nationals and Dodgers. ** The Rockies are interested in re-signing free agent outfielder Carlos Gonzalez. The 33-year-old outfielder had some great seasons for the Rockies in his heyday but has settled into mediocrity the last couple of years. Last year he batted .276/.329/.467 with 16 home runs and 64 RBI in 132 games. Quick Hits: Utilityman Hernan Perez underwent surgery to remove the pisiform bone from his left wrist after the 2018 season. He is expected to be ready for the start of spring training. ... Rockies signed 1B Mark Reynolds to a minor league contract with an invitation to spring training. ... Pirates signed RHP Brandon Maurer to a minor league contract with an invitation to spring training. Mauer registered an awful 7.76 ERA over 37 appearances with the Royals in 2018. ... Andrew Cashner (knee) expects to carry a clean bill of health into spring training. Cashner posted a wretched 5.29 ERA and 99/65 K/BB ratio in 153 innings with Baltimore last year. ... Pirates signed OF J.B. Shuck to a minor league contract with an invitation to spring training. Shuck posted a brutal .192/.255/.231 batting line with zero home runs and four RBI in 142 plate appearances last season with the Marlins.